In Windows 10, the Hibernate option is not visible on the power menu because it is disabled by default. It is very easy to turn it on, and I will explain that in a second. First, let me explain why it wasn’t turned on by default. The reason for the hibernate option not being enabled by default is because the Shutdown option does something similar. Windows 10 has a feature called Fast Startup, this feature helps boot your PC faster after you shutdown. On older windows operating systems like Windows 7, a shutdown would close all open programs, sign out all users, unlink the windows kernel, disconnect all devices and drivers, close all background processes, and turn off the computer. It is then considerably slow to boot up the PC again which is why many people prefer to hibernate instead. This has changed in Windows 10 though. A shutdown (with the fast startup feature enabled by default) will only close all open programs and sign out all users but will save the current state of the computer to the hibernation file so that the computer boots up quickly next time. Select “Choose what the power buttons do”, which you will find on the menu on the left side. On that page, you’ll find a link that says “Change settings that are currently unavailable.” Click on it so that the Shutdown Settings below it become editable. Tick the checkbox that says Hibernate – Show in power menu. 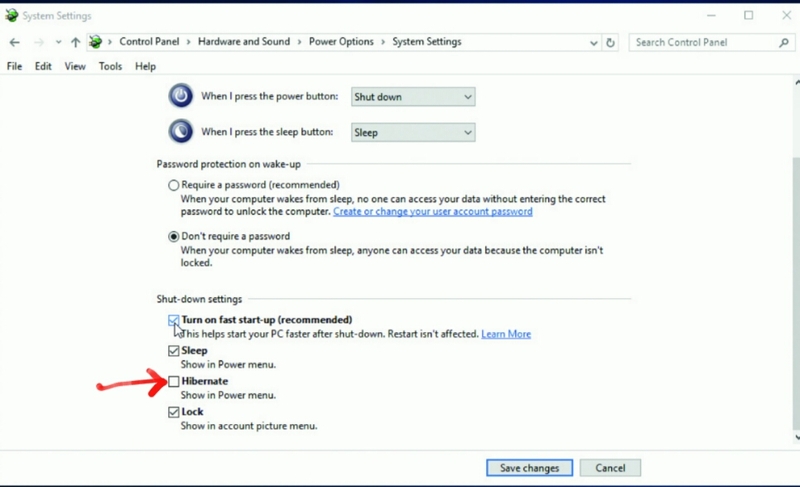 Now you will notice that the good old Hibernate option now appears in your power menu.